Ngarkat Conservation Park was proclaimed in 1979 and is one of the largest Mallee Parks in South Australia. It is 270,000 hectares of vegetated sand dunes mallee and heath. It was originally a pastoral lease in the 19th century. Today, after some very small amount of persuasion from VK5PAS, Paul, I decided to detour to Ngarkat Conservation Park, VKFF-829, just south on Pinnaroo. After spending the night in Ouyen, Victoria, we made our way to the Victorian/South Australian border and just a few moments later arrived in Pinnaroo. It was a cool morning, but the sun was shining. I thought a coffee was in order. I was sitting in the bakery (no I was not eating cream buns) quietly enjoying my coffee. Suddenly my phone almost jumped off the table! I received a text message from Paul. He was asking whether I was considering a further activation. I wasn’t all that keen. I texted back and said I could be persuaded. That was enough. Paul phoned me back. We were laughing and talking and I thought I might be arrested for disturbing the peace in the bakery. I do, after all, have a substantial voice! However, I survived! After coffee we left Pinnaroo and soon were tracking down Rosy Pine Road towards the Park. We thought we would enter the Park at Pine Hut Soak, where there is a camp ground. The place was deserted. 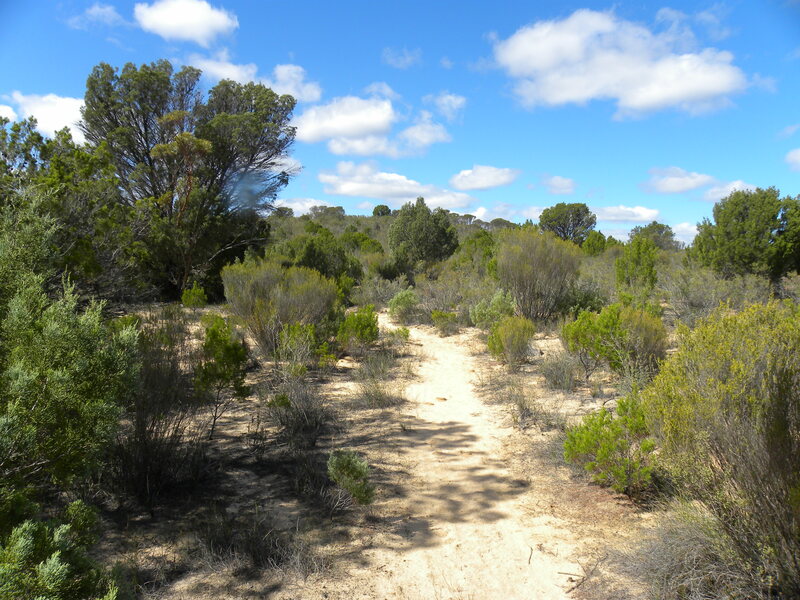 And it was just beautiful: typical Mallee country, sand, little understory but well-developed Mallee scrub. The camp is at the start of the famous Border Track. I had not driven this track, which despite the rain, was open. It would be foolhardy to be tempted with just a single vehicle. I was on the air on 40 metres at 01:44 and my last contact was at 02:54. In just over an hour I enjoyed 28 contacts. I have sufficient investment in the Park to return to build up my contacts 44. Finally, for those interested in the Mallee Parks of Victoria and South Australia you might find this publication of interest. Nicholls, G. & Angel, A, n.d. circa post 2002, Mallee Tracks: A Wanderer’s Guide to the South Australian and Victorian Mallee, self-published, Pinnaroo. My wife purchased her copy a few years ago and she saw an advertisement for the book at Pinnaroo so it is still available. An internet search might turn up some copies. This publication provides many interesting details of all of the SA Mallee parks, including maps, tracks and historic sites. A more up to date version is available for download from the Department’s website. Here is my log in Fast Log Entry. This approach saves many, many keystrokes! I have activated the Park before. Here is a link to that activation. We arrived in Echuca at about 3.15pm, secured accommodation and then decided it was too late to drive to Terrick Terrick National Park for a second visit. So we went back to the Barmah National Park and I began to set up just inside the Park boundary not far from where the Kingfisher Cruises leave. I decided to use a picnic table as the point for setting up my station. As I was doing this a 4 x 4 came along on the trip out from the Park. The driver pulled up in a hurry. A tall man with hair the same colour as mine got out. He had a wide grin on his face and came marching over. I soon realised it was Tony, VK3VTH/P3. Tony told me he had been in the Park and successfully activated it with 66 contacts including some DX. What a great experience. We chatted for about 15 minutes before he had to leave for his campsite. Tony and I tried, unsuccessfully to meet in the Brisbane Ranges National Park. I am sure pleased we were more successful this time. I asked him what made him decide to stop. He said he saw my squid-pole. I quickly gained 15 contacts, including two on 20 metres one of which was a DX station, YJ8RN, Rob. Beginning at o6:28 I had contacts with in order on 7.095: VK5ADL, David; VK5FD/M, Allan; VK5KBJ, Barry; VK5KLV, Les; VK3PF/QRP, Peter; VK3ZPF, Peter; VK5PET, Peter; VK2YW, John; VK3DBP, Paul; VK5YX, Hans; VK5ZGY, Greg; VK3HRA, Allen; VK2FBBB, Rob; on 14.300 Mhz, VK3FD/6 QRP and finally at 07:13, on 14.296, YJ8RN/P, Rod, at Loh Island, OC-110 in the Torres Group Vanuatu. 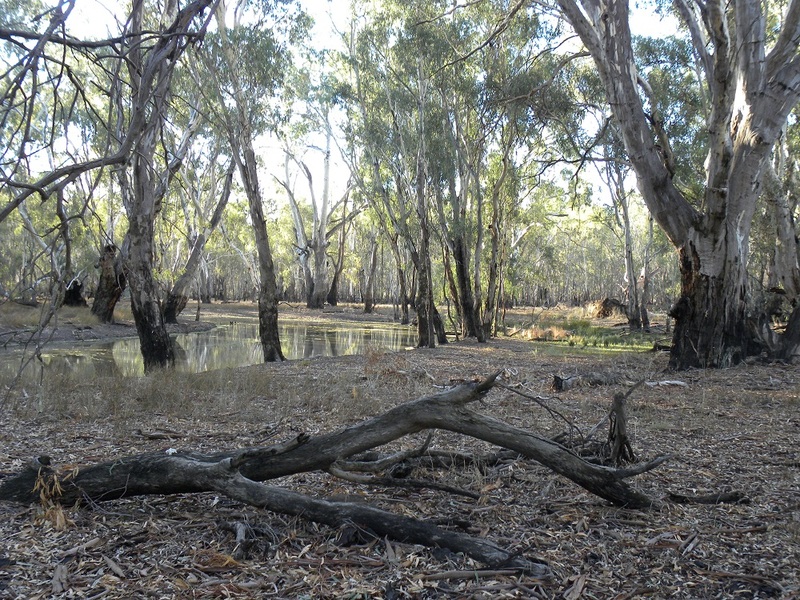 While I have activated Barmah National Park before it was not then registered for the WWFF award. I was very pleased to secure 15 contacts for a spur of the moment activation. Thanks to all who gave me a call. 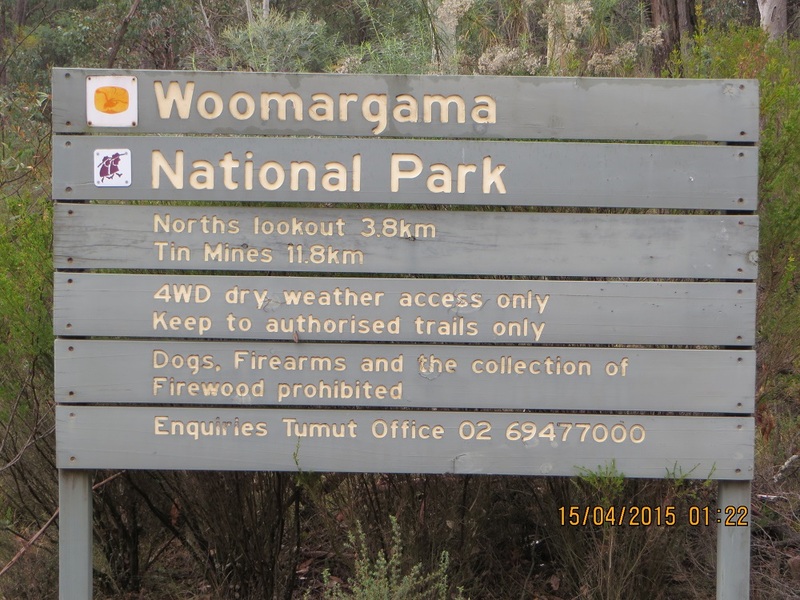 Woomargama National Park is about 30 kilometres north east of Albury. 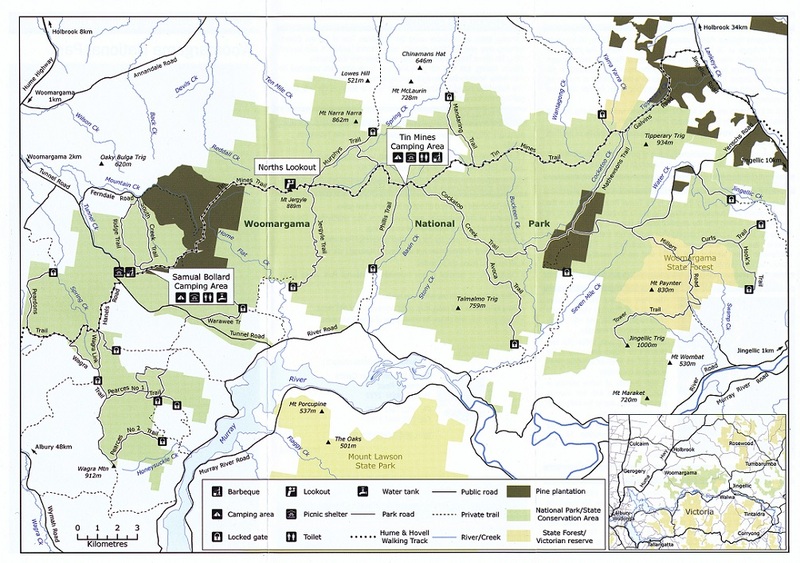 The Park is the largest protected area west of the Great Dividing Range and is renowned for the largest remnant box woodlands on the South West Slopes. Parts of the reserve are near 1000 metres above sea level and the Norths Lookout, where I operated on the 15th, is one such location. The views were stunning. The excellent Park brochure indicates that the Park provides well-marked public access trails and opportunities for off-road driving. 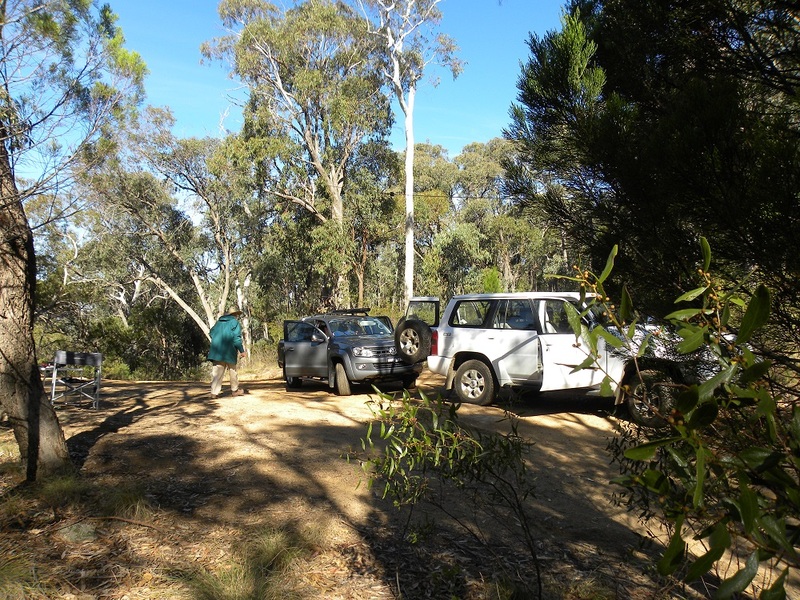 The 3.8k track from the edge of the private pine forrest to Norths Lookout was of intermediate 4 x 4 standard, probably because of the rocky areas and drop-offs on the track. I bottomed the Patrol at one point. The track can be navigated by ‘capable off-road vehicles’. High clearance is necessary and the tracks would be slippery today (17th April 2015). To visit the Park we stayed at the Great Aussie Holiday Park located at 14 Hore Road, Bowna. It is a great spot whether you want an unpowered tent site, a powered site or wish to live in ‘luxury’ in a cabin. There are plenty of activies for small people as well. The brochure indicates that access to the western side of the Park can be gained via Tunnel Road. That was the approach we took today for our second activation (17th April 2015). But on our first visit we left our camp and took the River Road from Wymah Road, and turned on to Tunnel Road from the Eastern end drove to the Samuel Bollard Camping area. 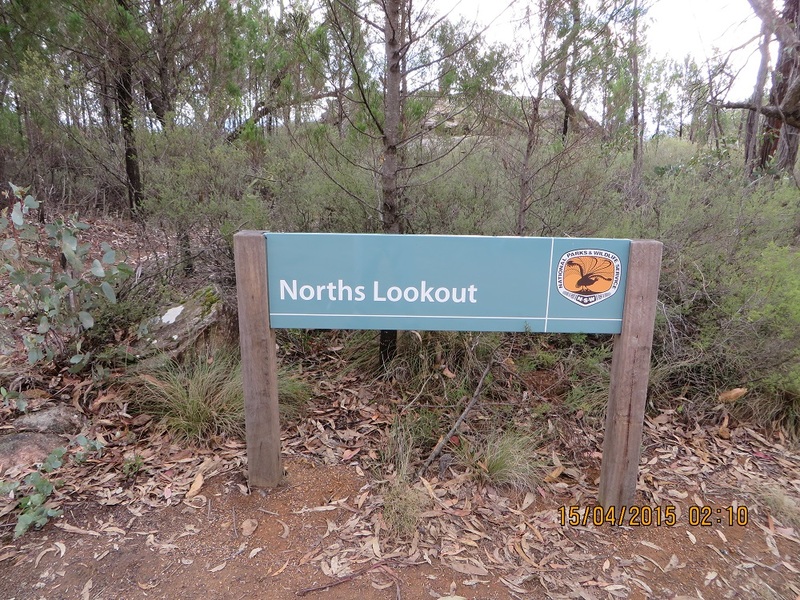 Then we took Tin Mines Trail through the Park, then through the private pine forrest before reaching the Park boundary and taking the 3.8k 4 x 4 track to Norths Lookout. Here is the map of the Park from the Government brochure. The two approaches we took are clearly visible as is Norths Lookout. Contacts I was able to secure 22 contacts on the first activation (15th April 2015) and 28 on my second activation (17th April 2015). I am delighted to gain my required 44 contacts for this Park, the first New South Wales Park where I have managed to jump the hurdle. I appreciate the chasers who made the effort to give me a call. I always appreciate the callers. 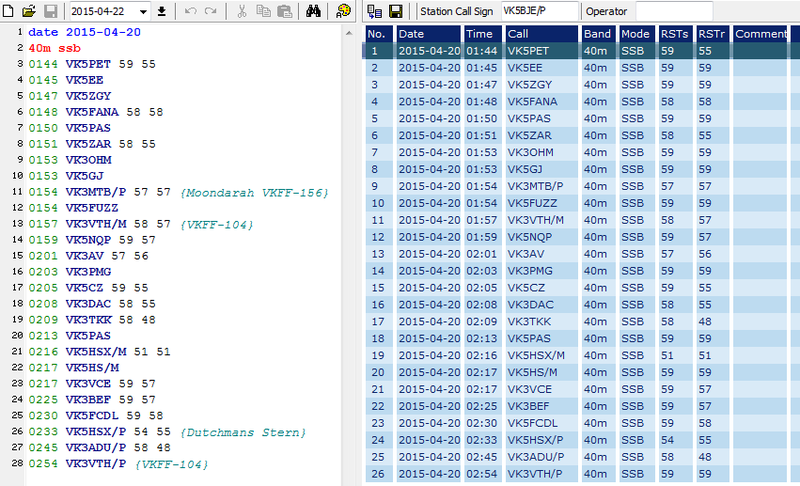 15/04/2015 7.080 VK5EE/P5, 02:49, s59 r51, Tom; VK2JDL/P2, 02:53, s57 r59, VK2/IL-004, Phil; 7.095 VK3HRA, 03:00, s59 r55, Allan; VK2IO, 03:01, s58 r43, Gerard; VK3OF, 03:03, s59 r58 Rex; VK3FQSO, 03:08, 58 54 Amanda; VK3TKK/M, 03:09, s57 r55, Peter; 7.080 VK3EQ/P3, 03:24, s58 r58, VK3/VE-014, The Horn, Mt Buffalo National Park; 7.090 VK5PXO s58 r53, 03:36, Les at Millicent; VK3NBL, 03:35, s56 r59; VK5NIG/QRP, 03:48, s51 r51, Nigel; VK2FABE, 03:49, s59 r57, Gary; VK5ZLT, 03:56, s59 r57, Allan, Bordertown; VK3DAC, 04:02, s59 r58, Fred; VK3LSD, 04:06, s59 r58, Les; VK3FOWL, 04:09, s53 r57, Julie; VK3NBL, 04:13, s59 r57, Ray at Melton; VK5IS, 04:21, s55 r54, Ian; VK3PF, 04:28, s59 r 58, Peter; VK3OHM, 04:29, s59 r59, Marc; VK2FMIA, 04:31, s52 r22, Doug; 7.090 VK2FADV, 0433, s57 r 58, Jim, Blaxland. This activation resulted in 22 contacts with one duplicate. My operating conditions were an FT897 set at 10 watts, 8.4 MAh LiFePO4 battery and a home brew 20/40m dipole. 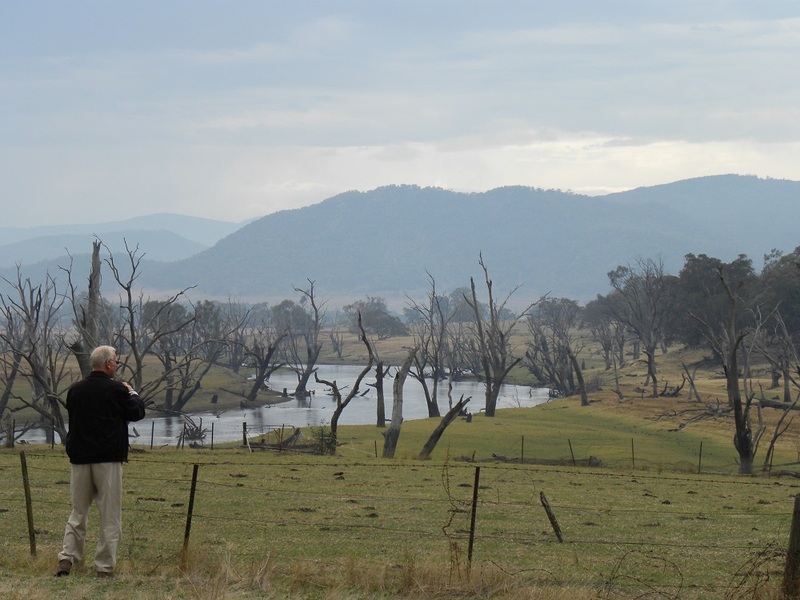 On the 17th April 2015, on a very wet morning, we left our camp and took the roads to the Hume Highway and then travelled north to Woomargama township. There we took a right hand turn to Tunnel Road and we drove until the Park was on both sides of the road, clearly visible on the map, and found a spot to set up my station. It was not a cold day but it was wet. 7.090 VK2UH, 00:16, S59 r59, Andrew; VK2JCC/P2, 00:26, s56 r56, Colin; VK5PAS, 00:38, s58 r55, Paul; VK5HCF, 00:40, s55 r55, Col; VK2FADV, 00:42, s53 r58, Jim, Blaxland; VK2BMU, 04:44, s59 r58, Bob, North Kellyville; VK3ANL, 00:48, s57 r58. 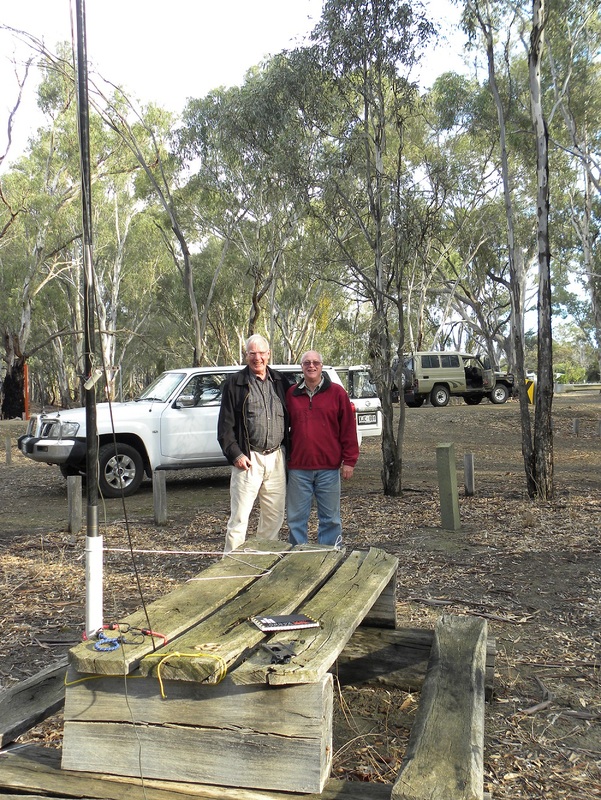 Nick; VK2XJS, 00:50, s58 r41, Julian, Oberon; VK2XAM, 00:53, s52 r53, Max QRP; VK3PMG, 01:00, s57 r58, Mick; VK5FAKV, 01:04, s58 r59, Shawn; VK7VDL, 01:07, s55 r51, Ron; VK3PTL, 01:09, s58 r57, Ian; VK3AXH, 01:11, s59 r 57, Ian, Ballarat; VK3ARR, 01:13, s54 r59, Andrew; VK2HPN, 01:18, s55 r57, Phil, Bredbo; VK2FAJF, 01:23, s57 r59, Steve; VK5HS, 01:26, s56 r55, Ivan; VK5FAJS, 01:28, s52 r55, Alan, Mt Gambier; VK5TA, 01:30, s53 r57, Tom; VK3FQSO, 01:31, s53 r56, Amanda; VK2MTC, 01:35, s59 r58, Greg, Cooma; VK5FMID, 01:40, s57 r57, Brian; VK3HRA, 01:42, s59 r56, Allan; VK3KAI/M, 01:44, s52 r45, Peter; VK3FPSR, 01:46, s59 r57, Peter; VK3OHM, 01:47, s59 r59, Marc; VK7VDL, 01:49, s43 r54, Bob. I enjoyed my visit to this spendid park and commend it to you, especially the VK1 and VK2 amateurs who live nearby. I wish to thank all of those amateurs who gave me a call. It is always appreciated. On Tuesday 14th April the day started with showers but it was not cold. It was our first full day with our son and his family. They travelled from Sydney to Albury to spend four days with us. The reason for getting together was to celebrate the birthdays of our two Grandchildren. 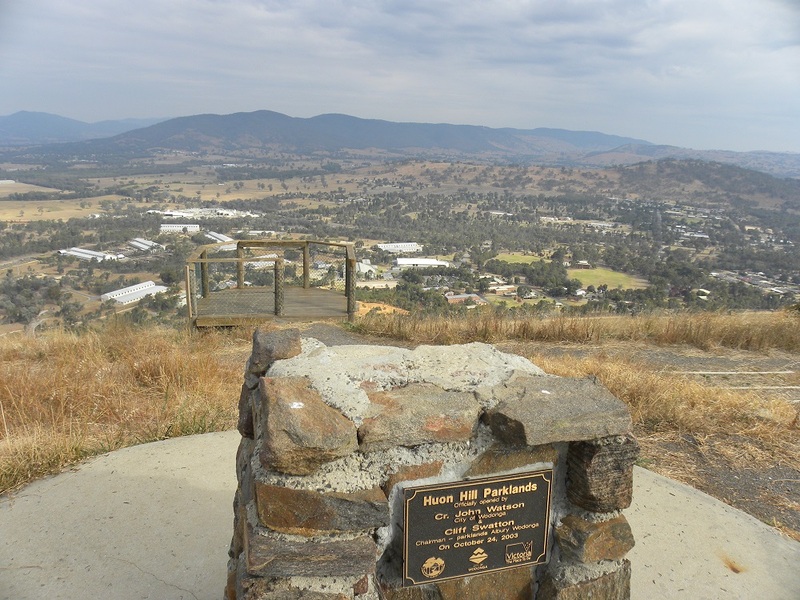 After shopping and finding our way around Wodonga for supplies we decided to visit Huon Hill. This hill is located very close to Wodonga and has been activated frequently. I thought I would activate the location: a spur of the moment decision! If the truth be told I couldn’t help myself! We drove to the parking area and walked the 200 metres (approximately) to the summit. 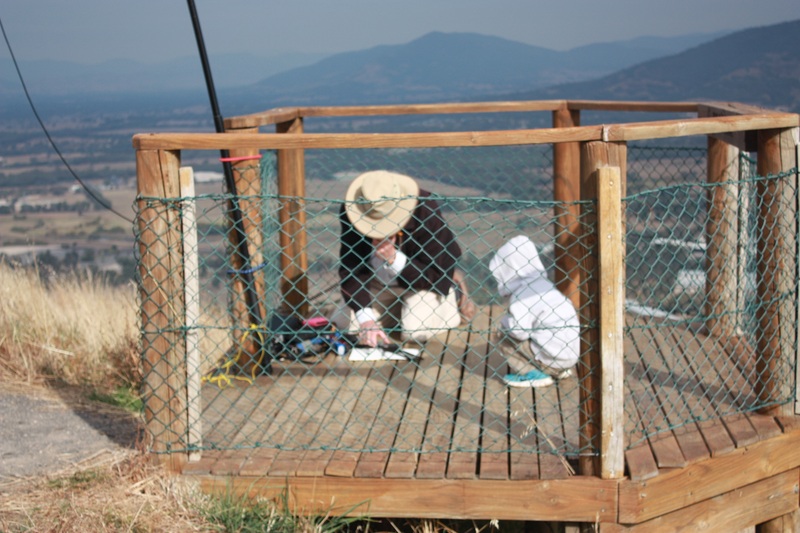 I set up my station on one of the lookout platforms and quickly secured six contacts. I have uploaded my contacts to SOTA. 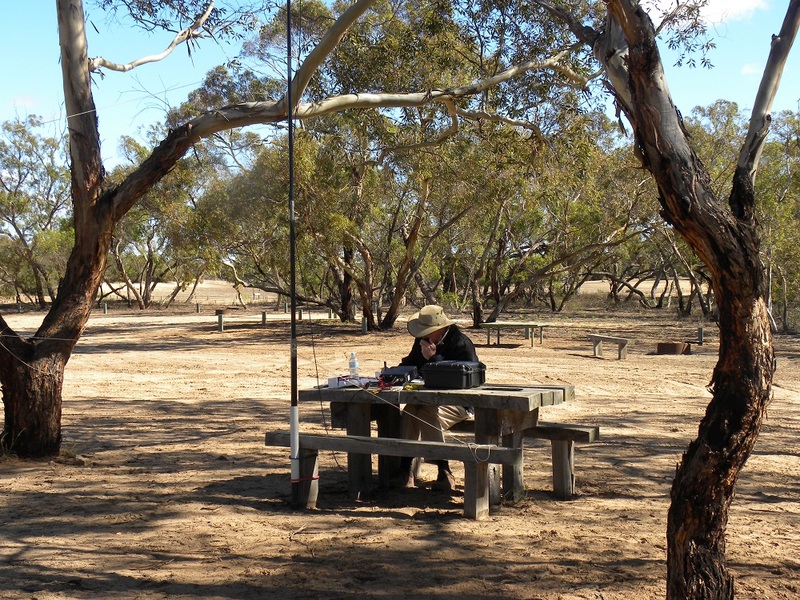 In order, on 7.090, beginning at 04:43 I had contacts with VK3OF, Rex of Swan Hill, VK3EMU, Graham, VK3UH, Kent, VK3NBL, Melton, VK2IO, Gerard and finally, VK2HFS, Frank. I used my FT817, a 4.200 LiFePO4 battery and 40/20 linked dipole. I thought band conditions were good. All signals were received at 5 and 9, except for Gerard at 5 and 6 and my reports ranged from 5 and 9 to 5 and 4. I appreciate those who gave me a call, especially those dedicated chasers who monitor 7.090 Mhz. It is difficult to spend much time on the radio during family time but my grandson was facscinated with what I was doing. I find the Pilates ‘child pose’ works well for SOTA. I can usually sustain such a pose for half an hour or more, but I do practice regularly and am a Pilates devotee!